Chris Crane, president and CEO of Exelon Corp., yesterday called on energy companies to support grassroots demands on Washington for climate action through policies aimed at cutting greenhouse gas emissions. 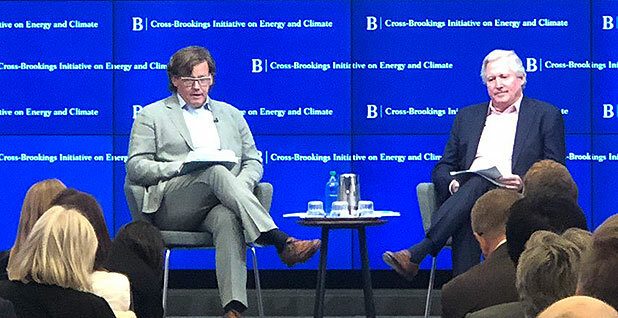 Speaking to a Brookings Institution forum, Crane — who leads the largest U.S. nuclear energy producer — repeated his company's case for federally mandated payments to money-losing reactors in the U.S. because of their zero-carbon electric power output. He suggested that support for at-risk coal and nuclear plants ought to be case by case, based on their importance to grid security, appearing to diverge from the Trump administration's 18-month campaign to channel revenues to uneconomic coal and nuclear plants alike. On the climate threat, Crane said, "It's just imperative that we build the tent that can help to make the story known and we take it away from what has become just a polarizing partisan bickering." Crane said companies that produce zero-carbon electricity should focus on expanding the reach of their message by 2020. "We can't make false promises to parts of the country that we're going to make fossil fuel cool again. We have to worry about what this is going to do to the whole country," Crane said, speaking of the carbon emissions from power plants that burn coal, natural gas and oil. Exelon has faced messaging issues of its own, as its push for support for Illinois nuclear plants triggered opposition from some environmental groups and energy suppliers that compete with nuclear power (Energywire, Sept. 14). Crane's remarks echoed an opinion piece published last week that he co-authored with Julia Stasch, president of the John D. and Catherine T. MacArthur Foundation. It endorsed the warnings in this month's report by the U.N. Intergovernmental Panel on Climate Change that the world is drawing dangerously close to a point when societies could not prevent or recover from disastrous climate impacts. Crane said his company is seeing first-hand the evidence of damaging climate change. Its utilities operate in Delaware, the District of Columbia, Illinois, Maryland, New Jersey and Pennsylvania, and it generates electric power in 19 states and Canada. "I can tell you as an operator, the climate is changing, as the storms come through and the ferocity of the storms that come through," he said. "The wind speeds we designed our systems to withstand are not the wind speeds we're seeing," he added at another point, one of several times he came back to the impact on the company, the nation's fifth largest gas and electric utility. "I can tell you from the storm patterns we're dealing with. I can tell you from the dispatch of our utility workers to the South, to Texas, Florida, to South Carolina, the flooding. The environment is changing. "Is it man-made totally? I don't know that. Is there some natural effect. I don't know that," he said. "I'm not a climate scientist. I am a realist. We are not going to deny it. We're going to try to get out in front of it." Crane said Exelon's position on climate responds to what its customers are calling for, revealed in what he called a "deep survey" of its customer base. The Trump administration's push for payments to both coal and nuclear plants had confused the issue, Crane said. Exelon's argument for reactors was based on climate grounds, while advocates for coal plant support were trying to save coal industry jobs, he said. "Those ideas got merged together and muddied the water," he said. "I will be the first one to tell you that some of the nuclear plants are small, uneconomic and they won't make it and they probably should not make it. Let's not save every one," he said. But large plants with multiple reactors facing retirement provide zero-carbon electric power that cannot be replaced by renewable energy in the time available, he added. Exelon's coal plants were not worth saving, he said. "We've gotten out of the coal business altogether. Our coal plants were built in the Eisenhower administration," he said. "They weren't efficient and couldn't compete." Energy Secretary Rick Perry's policy team has been advancing the argument that stopping premature retirements of an undisclosed group of coal and nuclear plants is essential to maintain a diverse source of power generation that could withstand extraordinary disruptions whether from cyber or physical attacks or natural disasters. But the search for legal authority to support such a policy has gone on for months, with opposition to the concept reported at the White House National Security Council (Greenwire, Oct. 16). Crane said he appreciated Perry's interest in Exelon's proposal for an entirely new strategy for confronting the most serious "black sky" threats to energy networks. Exelon wants federal intelligence and law enforcement agencies to draw up what they consider the most likely attack scenarios. These would form a "design basis threat" that utilities would be expected to defend against, according to Exelon. In particular, utilities like Exelon need to understand the vulnerabilities of the natural gas pipeline networks that provide their "just-in-time" fuel for power generation, he said. Rather than offering general financial support for a group of coal and nuclear plants, this approach would permit tailored defensive moves, he said. "Is there a dependency on a single transmission or multi transmission lines of natural gas that we should know how to protect? Or if they are made unavailable either through a cyber or physical attack, how do we keep the grid?" Crane said. Then the power grid operators such as PJM Interconnection, ISO New England and the California Independent System Operator can determine which coal and nuclear plants are essential, he said. "We need the intelligence from the government," Crane said.